Cotton is back, together with a lot of new actions! An adventure with the food-happy Cotton and the new character Appli. 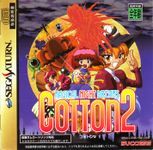 A chaotic action shooting game, set in the Pumpkin kingdom, who has lost its national treasure the Water Willow, and starring the hungriest demon in the world, Cotton, and the boyish girl Appli. A full port of the arcade version + Saturn original modes! A lot of techniques, including the four main.